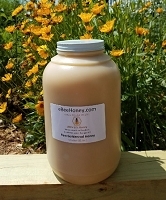 Raw Wildflower Honey in a 1 gallon container which is 12 pounds of honey. Right now we have both liquid and crystallized raw wildflower. Crystallized honey will always come in a wide mouth container! Choose your honey and container type below. Crystallized honey is always lighter in color than the liquid form. Raw wildflower honey in a 1 gallon container which is 12 pounds of honey. Raw honey has not been heated and simply filtered through a large mesh screen. The screen removes larger particles and allows pollen, propolis and beeswax particles to pass through it. Wildflower honey is exactly what it sounds like. Derived from a variety of wildflowers and plants which are blooming during the summer months. It's a thicker honey and the taste varies from year to year based on what's in bloom. This honey has a delightful taste and is darker in color. Darker honey has more vitamins, minerals, and antioxidant properties compared to lighter honey. I bought this to make mead. The aroma and taste are excellent, and I know this is going to be a great year for meadmaking. First time purchase from eBeeHoney. The wildflower is awesome. Great quality and very clean taste. Much better than any grocery store brand I have tried. 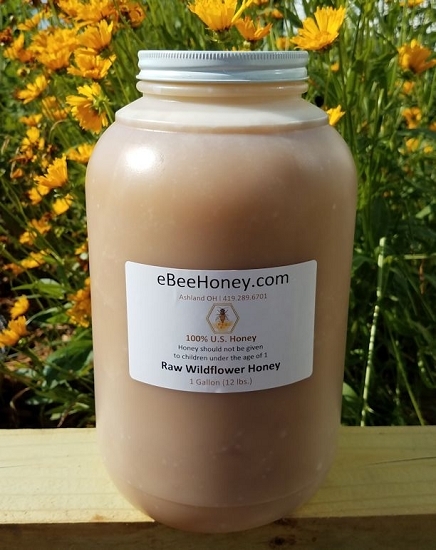 I have been buying/using wildflower honey from Ebeehoney for years & its always been consistently great & the team a Ebeehoney are always helpful if you are having a problem. Great Site! buying 2 or 3 gallons a year. Great product, great shipping! I really enjoy purchasing my honey at eBee. All the honey is good, but my favorites are the Locus, Wildflower, and Orange Blossom in that order. My last order a couple of weeks ago was for Wildflower and Orange Blossom. I open the Wildflower first and have been using that in my tea (yummmmm). Although I haven't opened the Orange Blossom yet I am sure it is just as good as the last time I bought it. Excellent product. I am very happy. It has a delightful taste. Fast shipping and an excellent product, exactly what I ordered. Thanks ?? Great tasting honey, easy ordering and quick delivery. I could not ask for anything better. This honey is very good and high quality, the service is excellent, this is the place to buy your honey from. Honey came in just a few days. Very tasty. Will order again. Thanks. I love this honey. It is local enough to me to call it "local," but price-wise, it is on par with other "local" honeys I can find, and in terms of taste, volume (I predominantly use honey and maple syrup as sweeteners, so I like buying in bulk), and the fact that eBee folks are super helpful and just nice, well, why buy honey elsewhere? 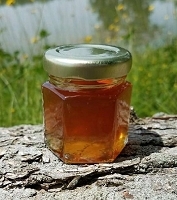 But again, the flavor of this honey is just excellent; not too grassy nor clover-y, and it is strong enough on its own but also blends well in cooking or my cup of tea. Just fine honey. Awesome flavor! Packed well, even when someone tried to open it, arrived out of box, upside down, still intact-and yet fairly easy to open. I use honey for everything! Good for cold, even putt a drop in Ann infected ear and it healed. I don't get as sick as anyone else in the house and it's better than benadryl for allergies! Wildflower has a mellow flavor, clover is super sweet. I use it daily, won't do without it. Raw has medicinal properties. The perfect food! All the reviews are true! Quick ship, great service, fantastic quality. Quick shipping, good info on website, good customer service and delicious honey! We have been using this honey for several years now, great taste and it also helps with my son's allergies. The only problem that I have with the honey is, now when I go outside, the bee's are finding me very attractive. My favorite. Taste cannot be described, other than to say that, if a container says HONEY, this is what it SHOULD taste like. Awesome!!! I'm a loyal customer ever since I bought my first gallon on raw honey about a year and a half ago. Always fast shipping. Great taste...my family loves it on fresh baked biscuits. This is the 2nd year in a row that I have purchased raw honey from ebeehoney. The quality and flavor is excellent. I use the honey for making mead and it always produces a superior mead. I am very pleased with purchasing bulk honey from Ebee. Orders always ship fast and product is always top notch. I believe I have ordered 6 or 7 gallons of raw honey over the last 3 years and have never been disappointed. My only comment would be to try the sample pack as the honey flavors are very different. My children did not like the Buckwheat honey but only because it did not fit their thoughts of what honey should look and taste like. Ebee has great products and customer service, I plan on ordering many more gallons in the future. 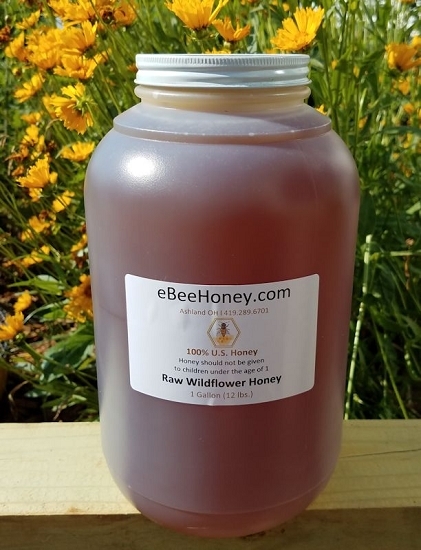 I have been ordering raw honey from ebeehoney for years. I would not order from anywhere else. The quality of the honey is top notch and Glenn and Becky Magrum are just wonderful people. I talked with Glenn on the phone one day and it was like talking to a family member. We have tried all the different kinds of raw honey and find that the wildflower honey has the best flavor and stays liquid longer than the others. I am from Taiwan and I use the honey every day in my cooking and herbal teas also. I cannot say enough about these great people and great products. You don't get service and quality like this nowadays so treasure this now. Being a first time customer I was very hesitant to order because I'd never heard of Ebee honey. After reading the amazing reviews I decided to go ahead and try it especially since the pricing was so great. The local raw honey I was buying from my local honey farm was so much more for less honey. Even with the cost of shipping I would still be getting more honey for a lot less. Since we go through a lot of honey from baking to using it as a sweetener for coffee I decided to buy the 12 Lb. container of the liquid Wild Flower honey. Not only did it arrive immediately but I was shocked at how wonderful it tasted. I am not the type of person to write reviews nor am I one to believe reviews especially when all the reviews were so great but I must admit that all the reviews I read were indeed spot on. My family and I absolutely love this honey and without a doubt will be making this our go to place for all our honey needs. The only issue I had was with was the cost of shipping for the smaller jars of honey because it's more than the actual cost of the product. Other than that, I think the honey is of great quality and taste. Highly recommend it. All of the honey is great, I've bought almost all of the honey sold here. However, I use it to make mead (honey wine) ever batch so far has been great! 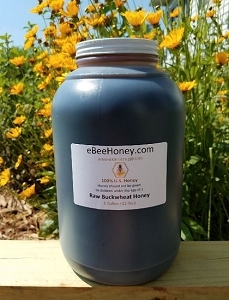 This raw honey is a really beautiful color and has a great taste! The price is right, shipping is fast... the large narrow-mouth jugs with pour spouts are a big plus! I've been getting about six gallons of eBee honey every year since I stopped using any other sweetener except (very occasionally) maple syrup. When I was speaking to my sister the other evening she was complaining about acid reflux. It was at that point that I realized that my acid reflux has completely cleared up in the past few years. I can't say definitely that the honey did it, but when it was really bad, I would mix honey with slipper elm bark powder to get immediate relief. That was before I stopped using sugar. Now, with the changes to my diet, I feel much better all of the time. I've been buying our honey from EBee now for several years and haven't bothered to look elsewhere. EBee provides their customers with quality products, some of the best service from any company I've ever dealt with and they truly care about what they do. Passionate is probably the best way to describe how they feel about their products, and in my opinion rightfully so. The quality of the honey I receive is the best I've ever had and I will continue to buy from and support EBee. I love this honey, so glad I found this place. Honey has a mildly sweet floral taste to it, quality is exceptional. Also great value! I'll never buy my honey anywhere else! I have been having raw wildflower honey every morning with warm water and lemon. All my spring allergies went away after 1 year of this morning routine! I am hooked on this pure stuff and so is my family. The liquid consistency is also great on pancakes and waffles for the kids. I love this honey! This is the second time I have ordered this honey. I do bulk order for my friends and family and we save on shipping. 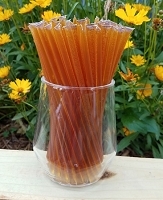 The honey is great for early morning drink, my son's allergies, and upkeep of the overall immune system. I'm so glad to have found ebeehoney. 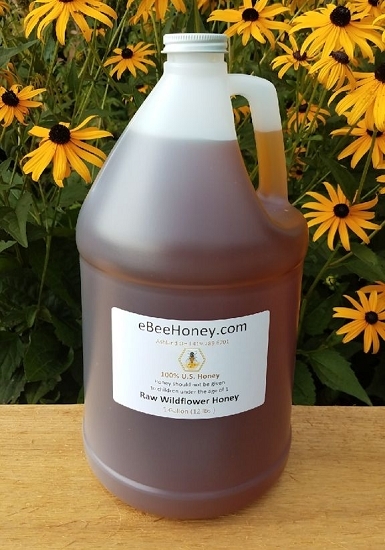 I ordered a gallon of this honey to share since it is so much more cost effective than buying from a store and of course, go local and raw and all that good stuff! I did not choose wrong with liquid in a wide mouth container, it makes it easy to pour and distribute and it just so tasty. My order also came in nicely packaged in a very timely manner, I was pleasantly surprised. Thank you ebee! I am on my second 1 gallon container of the raw wildflower honey and I love it. Great quality and taste. Both orders came in the mail in 3 days. Very satisfied and will continue to get this product. Great taste, fast shipping and good prices makes ordering from ebeehoney a pleasure. Excellent honey! Fast shipping. Have ordered this twice, and will be ordering more in the future. All I use is honey as a sweetener. I believe processed sugar is poison, and that honey is the only sweetener that is natural and healthy, plus the medicinal properties it has. The honey is delicious and we love it. Will buy again. Thank you Bee,s and keepers. I was shocked! I had an ear infection with swelling below my ear and unable to eat. This got worse for two weeks and couldn't get to a doctor. I put some raw wildflower honey right in my ear (with a Q-Tip. In 24 hours the swelling and pain was gone. Washed it out a week later (just to be sure it was gone) and it has not returned! Call me crazy, but I slap it on burns, eat it for sore throats, sneak it into Kool-Aid when the grandkids are sick. I prefer wildflower because its not as sweet as clover, and has a licorice flavor. My miracle "drug." Won't hesitate to buy from you again.I am very satisfied with the quality and the taste.I'll recommend you to all of my family and friends. A 5 all the way! Great tasting honey, great service, great communication. We use it mostly on cereal and oatmeal in the morning. We also have to give the dogs some as they have come to expect (understatement) their morning treat. This wildflower tastes fantastic, but we also like the Bamboo and the Buckwheat honey (5 lbs each), which are the only ones we've tried so far. We've ordered the gallon size of the wildflower honey twice now. The first time was crystallized, the second liquid. Both have had excellent flavor. We use this honey on just about everything. Great in hot tea, replace sugar in baking recipes and such. Will continue to order this honey from ebee. Great company and fast shipping! Exceptional quality, fast delivery, great price! My wife and kids love this honey. No more processed honey for this family.